How quickly should you begin to introduce potential students to the faculty at your college or university? The answer likely varies from school to school. 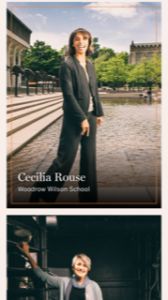 Relatively few schools introduce individual faculty right from the start of the admissions home page. Princeton University is an exception. Our Link of the Week page is available from a prominent invitation just under the opening image on the Princeton admissions page that introduces one of the 16 easy-to-scan faculty profiles that are on the full faculty profiles page. As always with groupings like this, we have a marketing research opportunity. Which of these links are most followed by people visiting this page for the first time? Google Test My Site gives the Communications page an “excellent” 2 second mobile speed rating, estimating a “low” visitor loss from download speed. Yes, even a page with 16 faculty photos can download quickly to a smartphone. Visit an unusual presentation of 16 faculty profiles at the Princeton University “Faculty Profiles” page. Join 609 people on the Top Tasks: Higher Education Website Content group on LinkedIn.